Mangoes abound here in the Philippines every summer-time. They are rich in Vitamins A, B, C, potassium, calcium, and iron. 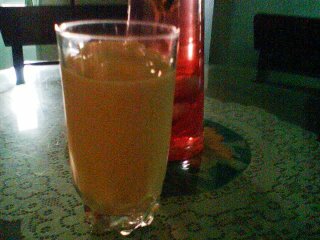 It is also rich in minerals and anti-oxidants. It contains enzymes that aid in digestion and stomach soothing properties. Just like any other fruit, it has high fiber content which lower blood cholesterol, gives protection against degenerative diseases, and aids in cancer prevention. Green mangoes are very much loved by Filipinos. They are eaten as is or dipped in bagoong. They are also served as appetizers mixed with fresh tomatoes. Mangoes are exquisitely sweet when they are ripe. They are peeled, flesh cut away from the stone, served as dessert, mixed with cereals or yogurt, made into marmalade or juice, pureed into sauces, or as what you see in the picture - a mango shake! My kids love this. Mango shake is a very refreshing summer drink. It is very easy to prepare and very delicious. Just put everything in the blender - fresh pitted mango, milk, and ice cubes - blend until smooth and presto! You have a refreshing mango shake. 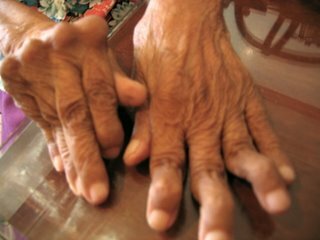 In the photo are the fingers of my patient, R.B., 52 years old complaining of joint pain, stiffness, limitation of motion, which are the symptoms seen in osteoarthritis. Osteoarthritis is the most common form of arthritis. It is usually caused by the breakdown of the cartilage that covers the ends of bones. This cartilage normally functions as cushion in between bones. As a result of degeneration, bones rub against each other producing the symptoms of joint pain and swelling. Osteoarthritis commonly affects the fingers producing small nodes due to the presence of spurs (outgrowths). These nodes are usually painless but they cause limitation of motion. Bangus or milkfish, our national fish here in the Philippines, is classically very Filipino. It is widely available because it can be cultivated in brackishwater, freshwater, pens, and fishponds. It can be grilled whole or cooked in various recipes such as sinigang, pinangat, lumpia just to name a few. Actually bangus can be cooked in 101 ways. These different ways of cooking bangus is being presented yearly during the annual celebration of Dagupan bangus festival. Bangus can also be processed into various ways. It can be canned using ingredients such as tomato sauce, brine, oil, with tausi, escabeche, or French style. It can also be bottled in soya oil, corn oil, or Spanish style. It can also be dried, smoked, marinated, or deboned. Here in Pangasinan, bangus is available in various products: lumpia, nuggets, fishballs, patties, longganisa, and embotido. It can also be prepared into siomai, sashimi, chicharon, fermented with rice, kare-kare, etc. But boneless bangus is the most popular product. It is available as whole or in prime cuts such as bellies. It is sold locally and also exported in other countries like US, Guam, and Switzerland. 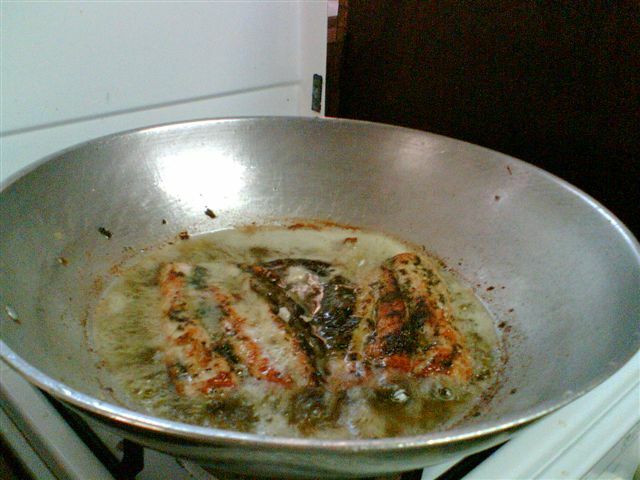 Bonuan boneless bangus is very popular. It has a distinct taste, of good quality, available in the frozen section of most supermarkets, and very affordable. With the bone removed, no more hassle of picking through fishbones. Fresh bangus is being sold in local markets at 70-100 pesos per kilo depending on the size. You can ask the vendor to debone it for you at 5-10 pesos per piece and then you have to marinate it upon arrival at home. Buying boneless bangus is a good choice, You get the best value for your money. In the photo is a gift to us by one of the medical representatives of Biomedis (Unilab Pharmaceuticals). 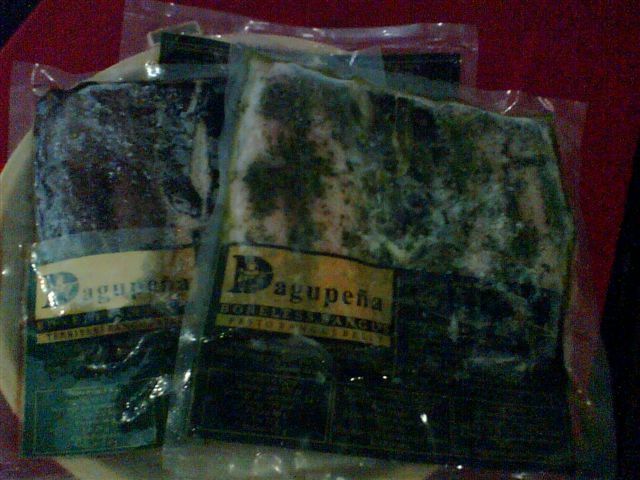 It is a belly boneless bangus from Dagupena restaurant. It comes in different flavors to satisfy your taste: teriyaki and pesto. Teriyaki is preferred by my children because of its sweet taste. It comes in frozen, you have to thaw it in water without removing the plastic cover. Once thawed, fry it belly side down for 4 minutes under hot oil then flip to cook other side. Serve it either with fresh tomatoes or tomatoes with itlog na maalat. Happy eating! Zea mays is the scientific name of corn. Although we can buy the locally grown variety in the market any time of the year, it is in summer months that they taste the sweetest. Here in Pangasinan province, you can see lots of vendors selling corn along highways. They are very affordable yet very sweet. They can be bought raw, boiled, or grilled. You can buy them raw and then roast or microwave them at home depending on your preference. Boiling is the traditional way of cooking corn. They are shucked, washed, and then dropped in a pot of boiling water. Cooking time usually depends on the age and size of the corn. It is important not to put salt on the boiling water as this may cause the kernels to toughen. They usually cook for 5 minutes under boiling water. Remove them from the water once they are done and they are ready to serve. Some prefer spreading salt and butter, others squeeze fresh lemon juice or kalamansi. If you want to be more exotic, you can brush olive oil and then sprinkle your favorite dried herbs. It all depends on your mood. Corn is a very good source of a number of nutrients including proteins, carbohydrates, folate, dietary fiber, vitamins A, B1, B5 among others. We all know that fiber-rich foods help a lot in keeping our digestive system run smoothly. Studies also show that fiber helps lower high cholesterol levels and decreases the risk of colon cancer. Folate which help prevent neural-tube defects (birth defects), is also found to reduce the risk of heart disease and stroke by lowering the levels of homocysteine, an amino acid which can directly damage blood vessels. 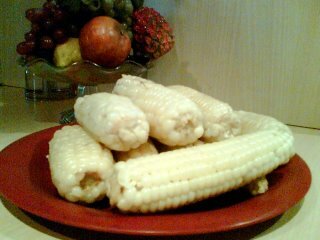 Thiamine (Vitamin B1), an important vitamin for the normal cognitive functioning of the brain, is also present in corn. This vitamin is needed for the synthesis of the brain neurotransmitter acetylcholine whose deficiency may contribute to senility and Alzheimer's disease. The nutrients mentioned are only some of the many valuable nutients found in corn. Corn has lots of beneficial effects on the heart and digestive system so make it a healthful part of your regular menu. 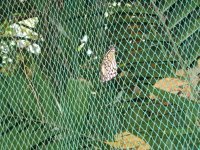 While we were at Leisure Coast Resort last Easter Sunday, we visited their butterfly kingdom. The picture on the left is what you will see upon entering the garden. It is my second time to visit the garden. On the first time we were there that was last year, there were so many butterflies in the garden. Now there were very few. Maybe because of the very few flowers that are in bloom this time. 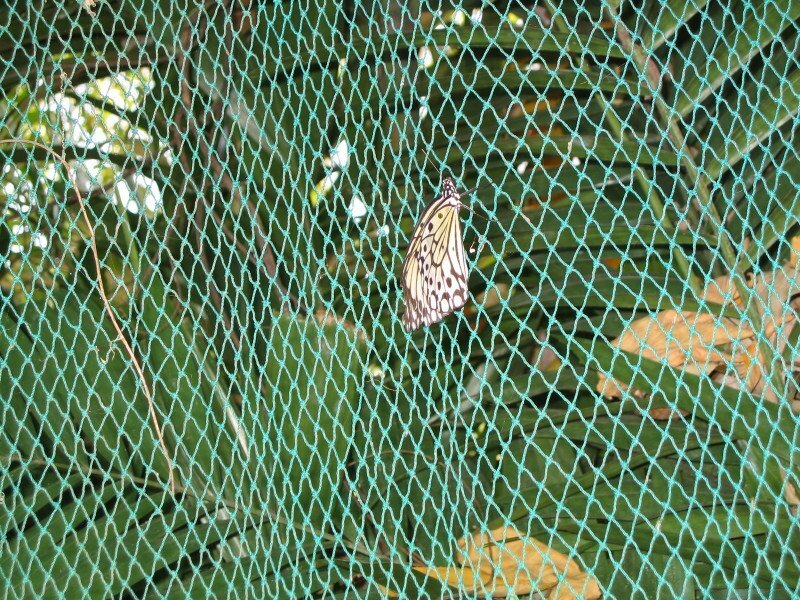 Butterfly gardens contribute to the conservation of butterflies. 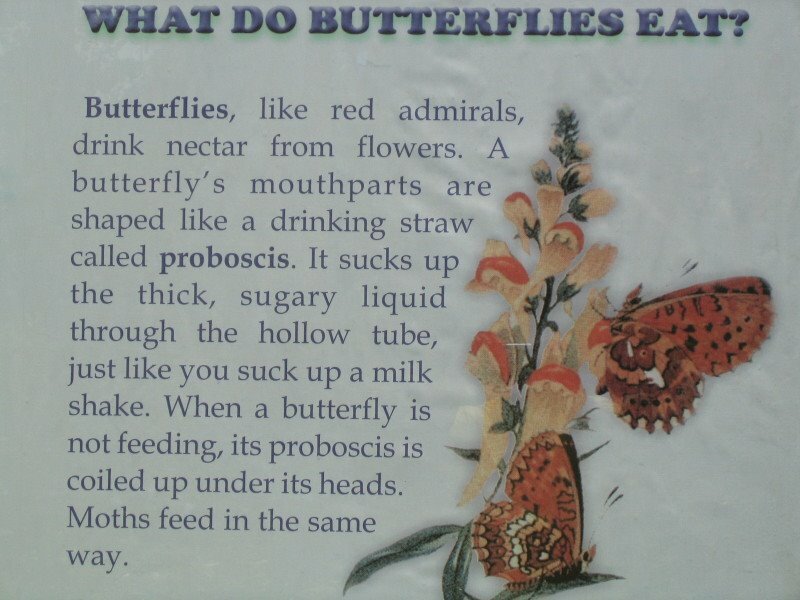 In order to maintain and increase their population in a garden, there should be plants that the catterpillars like to eat (host plants) and also plants that adult butterflies feed on(nectar plants). In this way you are already providing for their environmental needs, their food and shelter in order for them to stay alive. Since adult butterflies feed on nectar, you should also provide plants with flowers that bloom in sequence. These plants should be exposed to sunlight because butterflies love to stay in open sunny areas. They also prefer shelter from the high winds. My family's routine beginning from Holy Wednesday up to Black Saturday consisted only of going to churches and staying at home. Me and my husband both came from Catholic families and we both agreed to raise our children in the way we were raised following the teachings and beliefs of the Catholic church. It is only on Easter Sunday when we decided to go out and enjoy the day since it is really the right time for a celebration. We decided to go out swimming to Hidden Rock resort since it is their grand opening and we haven't seen the place yet. When we arrived at the place the pool was still close. We were told that they were expecting lots of visitors on that day. They were asking for an entrance fee of 50 pesos and then another charge of 100 pesos upon entrance at the pool area. We were thinking before we went there that at 50 pesos entrance fee we can already avail of all their facilities. On the short while that we were there we noticed that the place is somewhat small and with the huge visitors that they were expecting, we felt that we might not enjoy the day. So we decided to go to Leisure Coast resort. 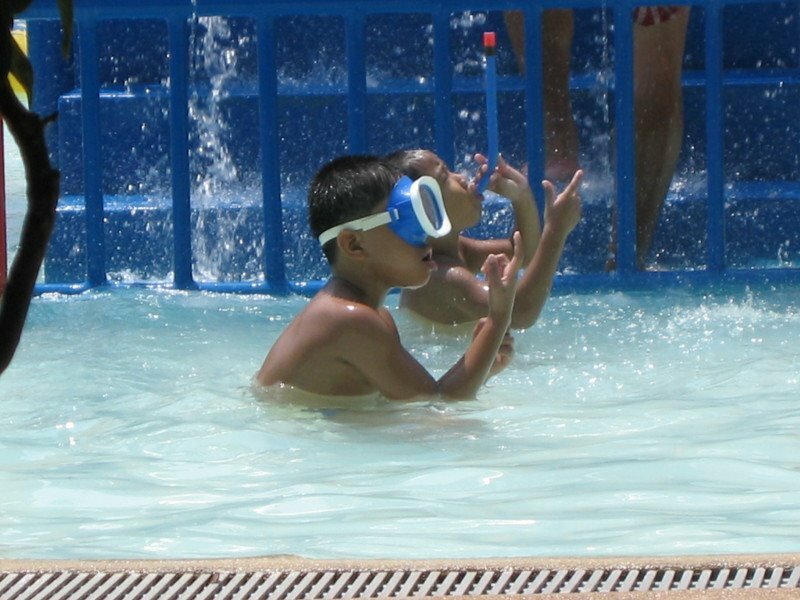 In the photo are my two sons playing at the kiddie pool of Leisure Coast. They just love to swim in this place. Actually every summer they spend most of their vacation swimming here. 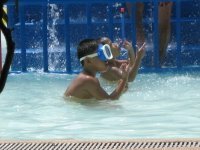 Since the place is just a few kilometers from where we live, it is very convenient for them to go and swim from 9am up to 4pm. With an entrance fee of 175.00 you can already enjoy their pools: kiddie pool, adult pool, wave pool, and a lazy river going around the big adult pool. In the picture is J.A., a 5 years old boy complaining of on and off fever for 3 days accompanied by productive cough. Physical examination revealed increased respiratory rate, harsh breath sounds, with rales on both lung fields. His grandparents who were with him when he visited my clinic have already given him paracetamol but to no avail. They were asking why is it that the fever keeps on coming back even though paracetamol is already being given? I said its because of the infection. I started him with antibiotics and mucolytics and advised them to continue with the paracetamol. They will go back to me for follow up after 3 days. I know its Maundy Thursday and I am not supposed to be working today. But since some patients keep on texting me last night, I opted to open my clinic just for two hours. These medicine samples are the only ones I have for today. There used to be plenty of medical representatives in our clinic from mondays to wednesdays on regular days. But since today is Holy Tuesday maybe most of them are now in their own provinces vacationing. It's good that I have 4 samples from the same drug company. Most of the time they just give one sample then they just remind me of their other products. Maybe because of the soaring prices of everything nowadays that even medicine samples start to dwindle. I remember an old family friend doctor telling me that during his time, they use to receive lots and lots of samples everyday that they do not need to buy medicines for their own use. Even antibiotics for adults are given in packages. How I wish that is still true till today. I used to conduct free clinics every two months in my clinic (Clinica Cayanga) and I use these samples to give to our less fortunate brothers and sisters. 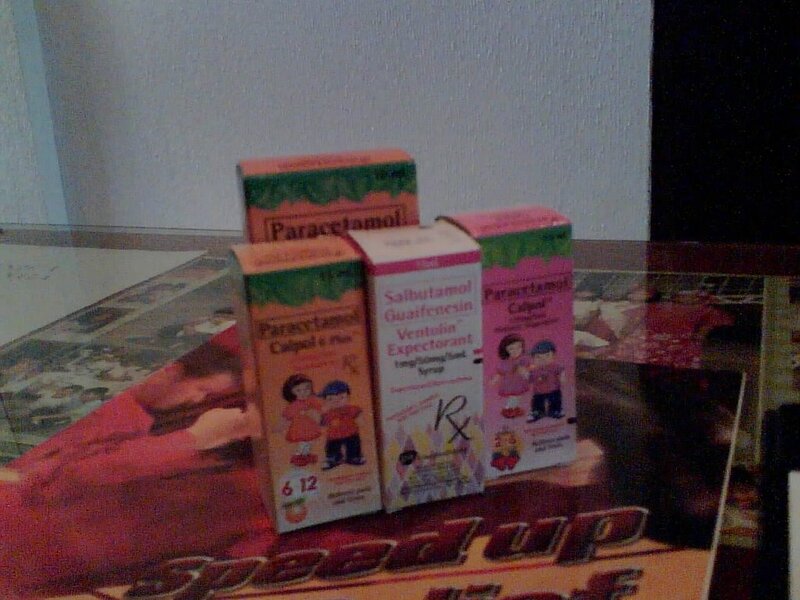 I solicit them from several drug companies and they support me by giving boxes of these samples. I did this for about 3 years sometimes adding my own stock-sized medicines whenever I feel that there is not enough samples to give to growing number of patients who benefit from my project. My last free clinic was December last year. It was then that I decided to discontinue because of the very few samples that I was able to solicit. Maybe it was a sign for me to stop this project. I am hoping that I can find other ways to help these people who have very little means of providing their own needs.